Vice Principals TV show on HBO, season one. Photo: Fred Norris/HBO. “Who shot Gamby?” That’s the question HBO is asking in the newly released trailer for season two of Vice Principals. The dark comedy revolves around a pair of high school administrators (Danny McBride and Walton Goggins). Each believes that he should be the Principal of North Jackson High School. The hate one another but decide to work together to oust the school’s new principal (Kimberly Hebert Gregory). The rest of the cast includes Georgia King, Busy Philipps, Shea Whigham, and Sheaun McKinney. Season two of Vice Principals premieres on HBO on September 17th. What do you think? 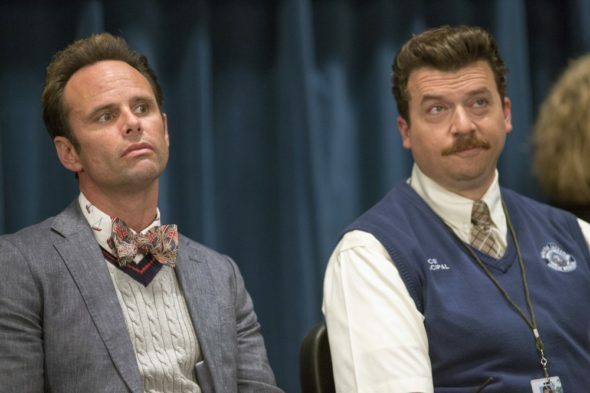 Did you see season one of Vice Principals? Will you watch season two? More about: HBO TV shows: canceled or renewed?, Vice Principals, Vice Principals: canceled or renewed?